Remember back in the nineties when there were loads of fly-on-the-wall documentaries about the police? Probably the most exciting part of the show was when the inevitable night time crook chase ended in a hovering helicopter using a thermal imagining camera to spot the offender hiding on a garage roof. Now we can have that much fun around the house, thanks to Seek Thermal. What we have here is a small device that directly plugs into your smartphone, either iOS or Android powered (there's a version with a micro USB an another with a Lightning connector), which then lets you see the heat signature of people, animals, objects etc. Basically the Seek Thermal turns your phone into a thermal imagining camera. Awesome. And awesome it is. 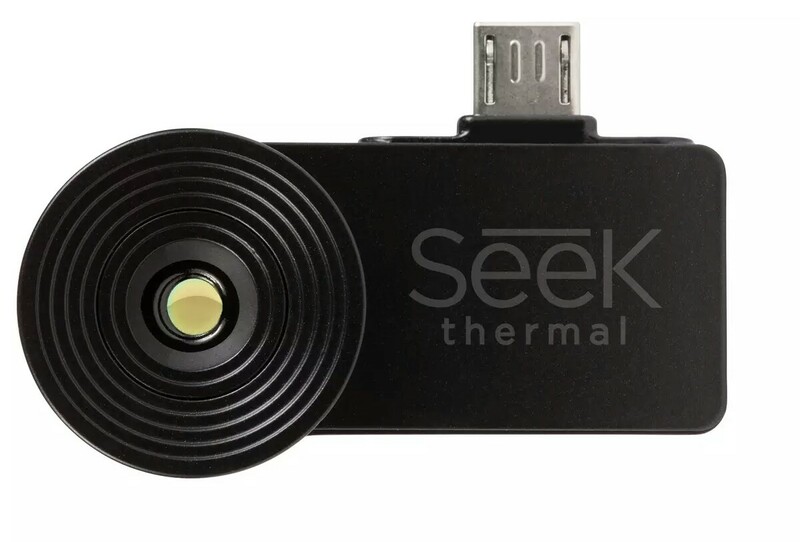 Simply download the Seek Thermal app, plug the device straight it, and the app will automatically open and present you an image of what it can 'see'. That means in less than a minute or two after opening the box, Seek Thermal allows you to be the Predator. Watch out for US Army Commandos! But why bother? Why would you want to be able to see the temperature of something? Well, we discovered that, once we'd got over the initial OH MY GOD LOOK HOW HOT MY HAND IS stage, Seek Thermal could offer a multitude of uses around the home and office. 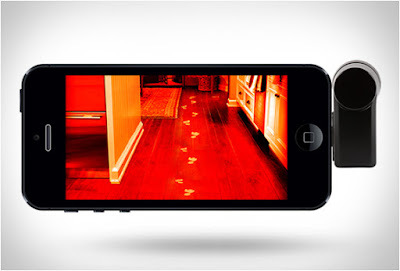 With the gadget attached to your phone you can see what is going on inside your walls, from electrical wiring to water and gas pipes. If you are drilling a hole and need to be sure where the live wires are, this can help. It can also assist in identifying water leaks, draughty gaps in windows and doors, and radiators that require bleeding. A hand! And a married hand at that! If you are a builder or a plumber, the Seek Thermal would seem to be quite a handy bit of kit then. Certainly it isn't something that will be bought on a whim, as at around £250 it ain't cheap. But, as well as the gadget's ability to see heat, the app also presents that data in a number of nice ways. You have a choice of showing the thermal image in several colour modes, from the bright and traditional setting where heat is represented by the whole spectrum, to a sinister-looking grey scale mode where people will look like black eyed demons. The bathroom sink; hot water flowing on the left, cold on the right. As the Seek Thermal app is essentially a photography app, you can of course snap pictures or record videos. The images and footage will capture whatever the app is currently displaying on screen, meaning you have the choice to record the on-screen temperature gauge, which shows how hot stuff is in either Celsius or, If you're old or American, Fahrenheit. 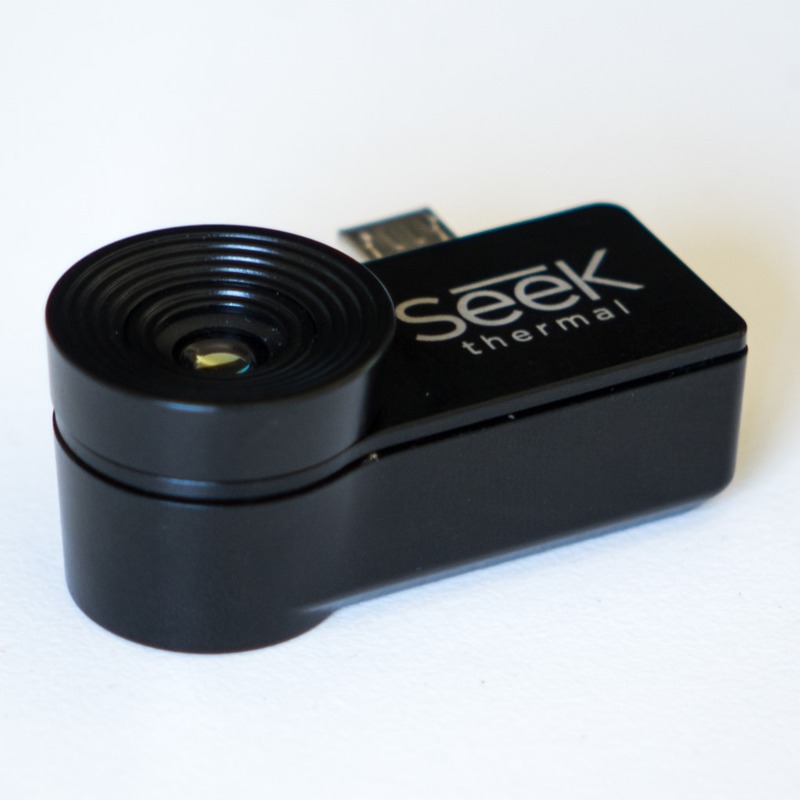 The Seek Thermal will also work in conjunction with your phone's conventional camera to create a split-screen image of an object or person. Mama and baby. Check out the difference between glasses and real eyes. Freaky. So yes, the Seek Thermal is tonnes of fun... to start with. If you're investing in one of these we'll assume it isn't just to muck around with and make weird videos of your heat footprints. Although smartphone accessories are often designed for fun and not to be taken too seriously, the Seek Thermal is clearly something that will be of infinite use to tradespeople, health and safety officers, medical professionals, the police, and even the military. Not many gadgets can claim that. Our WiFi router. Pretty hot, apparently. A huge LED TV while playing. Seems hotter at the bottom. Weird.